The Samsung SND-7082 High-Resolution 3 megapixel full HD WDR Dome Camera is encased in an aluminum die-cast chassis that provides unparalleled durability, making it suitable for both indoor and outdoor applications. In addition,weatherproof housing ensures uninterrupted surveillance in high-risk locations as well as in harsh weather conditions. Automatic gain control adjusts the signal strength to maintain a constant brightness level,Day/Night functionality with an automatic IR filter operation, the camera switches between color and B&W as per changes in the ambient lighting, ensuring accurate color reproduction in daylight and enhanced B&W images at night. 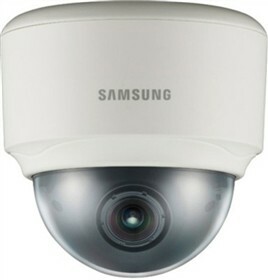 The Samsung SND-7082 has many exciting features for users of all types. The Samsung SND-7082 is sold as a Brand New Unopened Item.